From a festive detox salad to these vegan 6-ingredient chocolate caramel slices in three days flat. A quick change of pace and taste buds can only mean one thing: the holiday season is upon us. 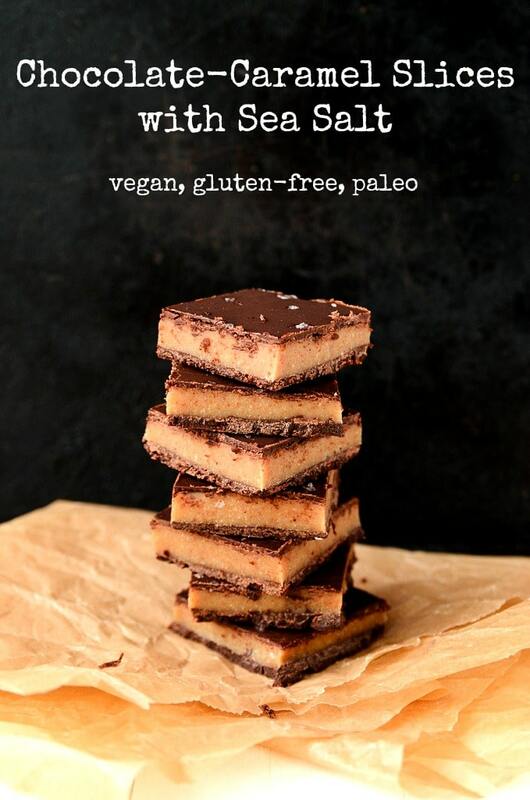 These vegan chocolate + sea salt caramel slices might look a bit familiar if you happened to run into this recipe for twix bars a few weeks back. After those turned out to be such a hit in our home and on the blog, I figured I could rework another recipe out of them. 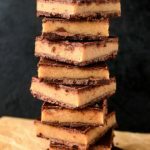 So, these chocolaty, caramely squares are essentially the top two layers of the twix bars + an extra layer of chocolate and a dash of sea salt. These little squares of heaven are refined-sugar-free and so darn delicious. Dan bit into one and immediately declared this to be his new favorite recipe. When I brought some out to share with a few family members over the holiday weekend, they lasted all of a few hours and elicited more mmmmm’s and ahhhhhh’s than I could count. With all that wordless praise, I’m confident when I say that these are sure to be a hit in your home too. Plus, they require just 15 minutes of active time in your kitchen and a painful but manageable 1-hour chill time in the freezer to set each layer. To make them, you’ll simply melt together cacao powder, coconut oil, and pure maple syrup, pour 2/3’s of it into an 8×8 pan, and pop it in the freezer to set. 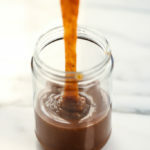 Then, you’ll make this 5-minute caramel, pour it over top of the chilled chocolate layer, and return the pan to the freezer to set a bit more. Lastly, you’ll top the caramel layer with the remaining chocolate and a sprinkle of sea salt before returning it to the freezer a third time. 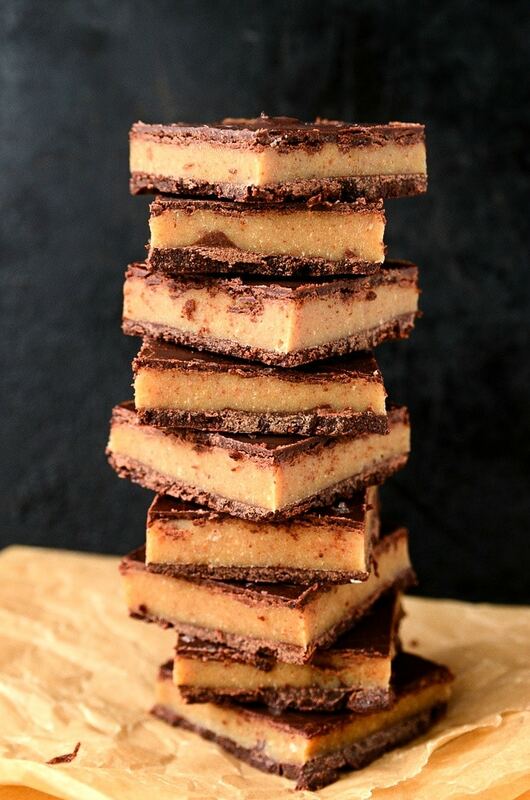 After an impatience-inducing 30 minutes, you’ll pop the large square out of the pan, slice into small squares, and sink your teeth into these little bites of chocolate-caramel wonder. You can store these squares in either the freezer or refrigerator depending on how dense you prefer the texture. I tend to love them most when they’re freezer dwellers. 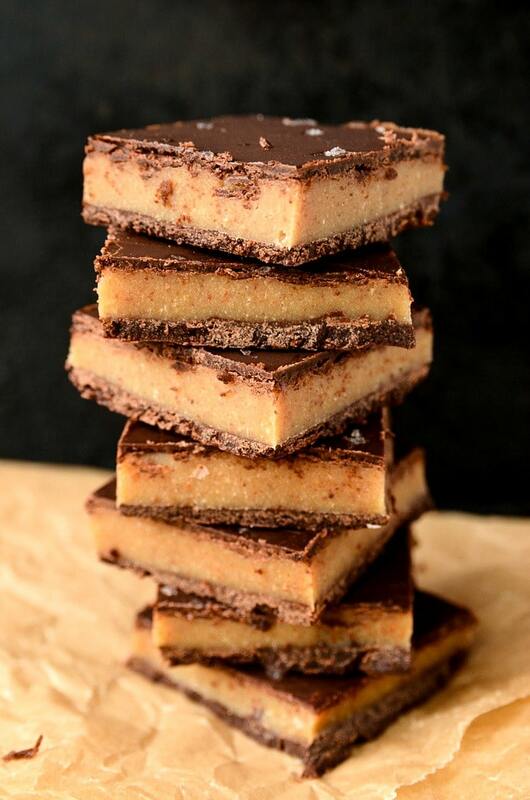 Sweet and gooey vegan caramel is nestled between crisp layers of rich dark chocolate in these delightful 6-ingredient chocolate caramel slices. Grease an 8x8 square pan with coconut oil. To make the chocolate layers, add the cacao, coconut oil, and maple syrup to a small pan over low heat. If possible, it's best to use a double boiler to avoid burning the chocolate. Stir constantly until the mixture is completely melted and smooth. Pour approximately 2/3's of the chocolate mixture into the bottom of the greased pan and reserve the other 1/3. Pop the pan into the freezer for 15 minutes to set. While the first layer of chocolate is setting, make the caramel by adding the almond butter, maple syrup, coconut oil, vanilla extract, and sea salt to a small sauce pan over medium-low heat. Whisk together constantly for 3-5 minutes or until melted. Let the mixture cool slightly. Pour about 2/3's of the caramel over the chocolate and carefully spread across (ensure the caramel isn't hot when you pour it over or it will melt the chocolate). 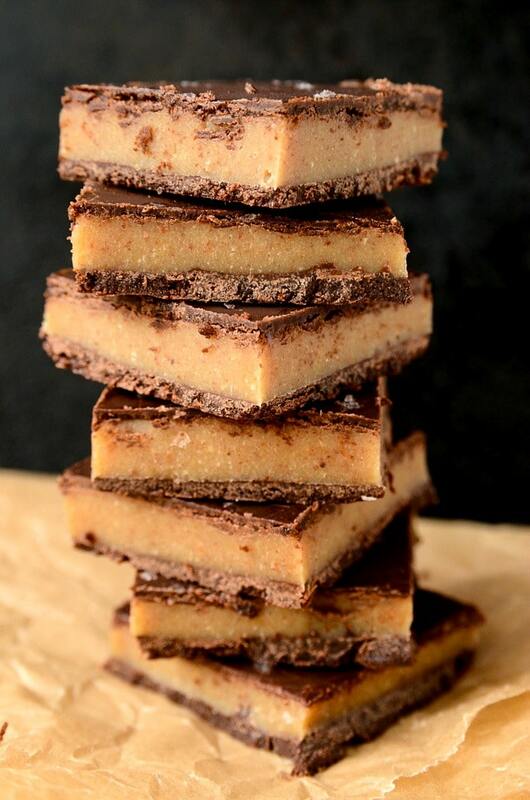 You can pour the entire batch of caramel over the chocolate if you want thicker squares, but I usually opt to refrigerate the leftover caramel for later. Return the pan to the freezer to set the caramel layer for 15-20 minutes. Pour the remaining chocolate mixture over top, carefully smooth out, and sprinkle with large-flake sea salt (optional). Return the pan to the freezer to set for 30 minutes. Carefully turn the pan over to release the chocolate-caramel bar onto a cutting board. Slice into squares and store in refrigerator or freezer. I was lucky enough to taste these the other day….I woke up the next day frantically looking for more in my fridge. I was even luckier when I found the last one. These are a MUST MAKE! No one will ever feel deprived eating one of these yummy treats. Wow, looks delicious! Could you use honey instead of maple syrup? Hi, Dominique! It has to be pure maple syrup to achieve the caramel flavor. May I know is it ok to omit the coconut oil as I prefer to go oil free and this also applies to your 5 ingredient chocolate covered ice cream bars. Hi, Shereen! The coconut oil is what sets the chocolate and the caramel. You could try substituting coconut butter in its place; however, I haven’t tried it myself so I can’t vouch for the results. If you give it a try, I’d love to hear how it works! 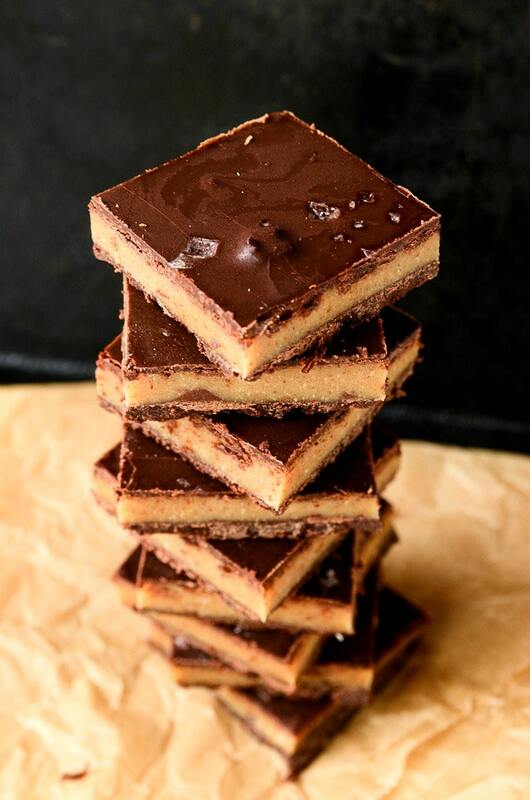 I am beyond smitten with these chocolate caramel slices! Anything with maple syrup, almond butter and chocolate is a win in my book! Thanks so much, Kate! I think that maple syrup, almond butter, and chocolate might just be the triple-threat of deliciousness. Hi there! 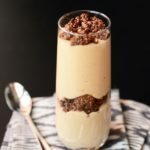 Just wondering if you t all your recipes and how strict you are? Not with veganism, as I am a strict vegan including my hygiene products and clothing as well but it seems (and I’m not assuming, just asking because I do not know you personally (: ) that you are almost too strict and must only eat “clean” and that sugar and such is demonized. I realize sugar is not the best thing for you but a little won’t kill you! Plus many women UNDEReat and slow their metabolisms. Just want to make sure you are being health conscious not “obsessed” because I really love your blog! Hi, Jen! Thank you so much for your comment and your thoughtful concern. However, I promise you that there is absolutely no need for it! 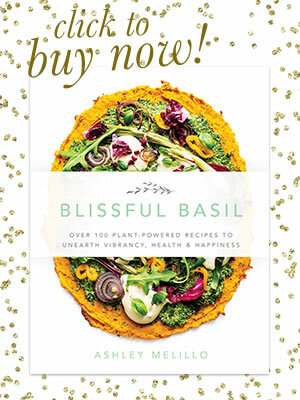 The recipes I create for the blog have been predominantly plant-based and made from whole foods simply because those are the types of recipes that I feel most inspired to create and share with others. That being said, I eat a wider array of foods in my everyday life than what I share on the blog. While I do strive to eat the foods that make me feel my best (i.e., plant-based) 80-90% of the time, I’m a strong believer in balance and the importance of intuitive eating (including treats). I’m sorry if something I said led you to believe that I demonize sugar or anything else, because that’s far from what I think and definitely not the message I want to convey through this blog. Rather, I believe that we should all treat our bodies, hearts, and minds with love and kindness and make choices (e.g., what we eat, think, do, etc) that embody those feelings of self-love. Most of the time, I feel my best eating plant-based foods (and lots of them), so I do, but first and foremost, I listen to my body. If I want a sweet, sugary treat, I have it. If I want to skip a workout, I do. I don’t think about any foods as being inherently good/bad, but rather know that there are some foods I want to eat more of than others in order to feel my best. 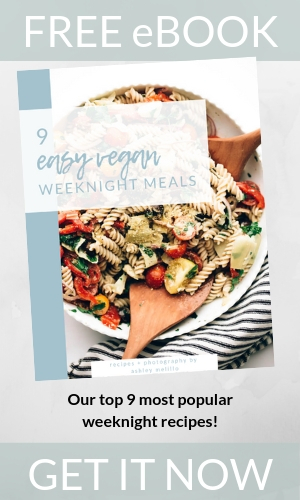 So, I share the types of recipes on my blog that make me feel and function my best, but these recipes definitely do not encompass the breadth of my beliefs on food, nor do they represent the most optimal meal choices for everyone. I hope this clarifies my perspective, and I’m sorry for the long-winded response, but I just wanted to make sure it was very clear! 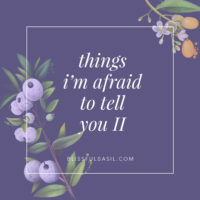 The last thing I want people to take away from this blog is that restricting or obsessing over foods is the way to go (especially since I work with individuals with eating disorders). That’s the very opposite of what I believe, because to do that would be to deny our bodies of what they need to thrive. And finding what makes each of us thrive is a very individual and precious thing. I’ve been wanting to make these for a few weeks now and finally found the occasion for it. I want to pack some with me as christmas treats, but I’ll be travelling for 5-6 hours… do you think they’d survive the trip without the fridge? Hi Terje! I’m honored that you’re going to make them for Christmas! If possible, I would make sure to freeze them beforehand and then pack ice around them for your trip as I’m not sure how the chocolate layers will hold up without being chilled. I hope they make it, and I hope you love the recipe! Happy holidays to you! I froze them before, but couldn’t really pack ice around them as we were travelling by plane. Unfortunately they melted quite a bit during the trip, so the looks aren’t that nice… (I made separate chocolate sweets out of them.) But the taste is wonderful! And I packed the remaining caramel sauce in a jar so we could drizzle it on ice-cream later. Absolutely delicious! 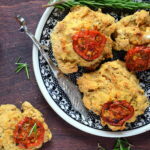 Would you mind if I shared this recipe on my blog as well? I’d share the separate chocolate sweets version (fortunately I took photos before the trip!) with links back to this page of course. Hi, Terje! Oh no, I’m so sorry that they melted during your trip — it’s definitely tricky to travel with food on a plane. Feel free to share the recipe with links back to my original post. Thanks for asking! it’s ok – panic is over – the slice came out easily after it sat out of the freezer for a few minutes. it is really nice and not overly sweet. Oh good! I’m happy to hear the chocolaty crisis was averted and that you’re enjoying it! Thanks for the feedback, Veronica! Yup, with chocolate it’s usually wise to use a bain marie. It’s way too easy to burn the chocolate in a normal pot, I’ve had plenty of weird chunks until I realised that water is my friend (as long as it doesn’t end up in the chocolate ;)). Thank you for the advice. Probably shouldn’t make this recipe too often anyway, want to keep eating them as they are so good. Thanks for replying, Terje! I’m guessing a bain marie is the same as a “double boiler”, is that correct? I’ll add in a note about using it as it definitely can burn if you’re not watching over it constantly and keeping the heat low. Apparently bain marie, double boiler and water bath are not the same thing… though I’ve been using them all in the same meaning. I googled for some extra info, found this: http://www.craftybaking.com/howto/double-boiler-method. Interesting. Thanks for researching, Terje! And agreed: chocolate + direct heat = risky business. Thanks so much, Clare! Also, I’m going to add a note in about using a double boiler/bain marie to make the chocolate layer. Chocolate definitely burns easily and can separate as you described. Thanks, Terje! I’m glad you’re enjoying it so much. 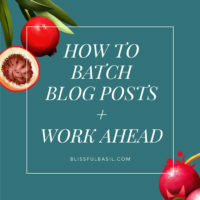 Thanks for linking back in your post — it looks great! I really try making this but I don’t have maple syrup! Can I use any substitutes? like agave? Thanks so much! I think agave should work in terms of texture, but the flavor won’t be nearly as caramel-like without the maple syrup. If you try substituting, I’d love to know how it goes! Hello! I made these today, and I substituted the almond butter for what I had on hand, which was Mayver’s Almond super spread- which had chia, sesame, peanuts, Brazil nuts, cashew nuts & hazelnuts in it. They turned out AMAZINGLY, and had a slightly more nutty flavor, which was nice, as the 1/2 cup of pure maple (straight from Canada on my last trip there!) was very sweet. Just perfect. Thank you! 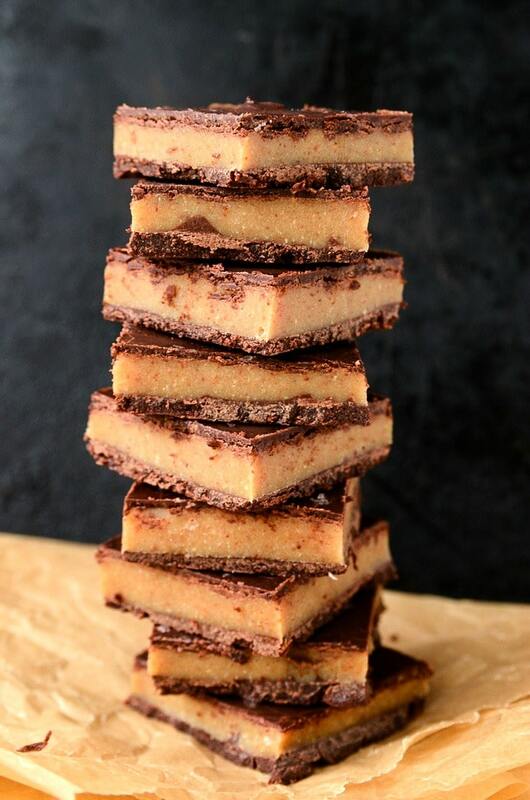 These caramel slices were absolutely divine and tasted out of this world! Although I originally had my doubts whether they would turn out as nice as in your stunning photos but I needn’t have worried! On a separate note, I wanted to say that your blog is just amazing and it’s become one of my top favourites ever since I’ve discovered it. You are a true talent & inspiration and I wish you the best of luck with your upcoming book – I shall be looking forward to the new recipes. Thank you for your superb work. Thank you for your support and kindness and for taking the time to share it. 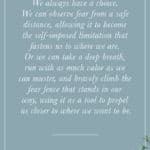 I’m touched that my blog has become a favorite of yours, and I hope you love the book just as much. All the best to you (and your caramel slice loving family)! Hi, Sara! 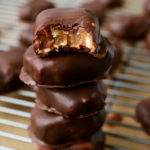 It’s hard to tell in this post, but if you go to the original 5-Minute Vegan Caramel post (should be linked), you can see the texture much better. At room temperature it can be drizzled just like dairy-based caramel, so I think it would be more like a thick glaze on cupcakes. When refrigerated, it does become scoopable/spreadable; however, it might be difficult to spread on cupcakes. All that being said, it’s seriously delicious, so if you don’t make it for cupcakes, I still hope you give it a try! I am wondering if you think this filling could sub for caramel sauce/frosting for cupcakes? Hi Ashley, I began making these and while I was making the chocolate part, the oil seperated from the cacao and maple syrup. No matter how hard i tried I just could get it back to being nice and smooth. Have I done something wrong? I would LOVE to try and make these again. Hi, Mia! I’m so sorry that you’re having trouble with the recipe. They definitely shouldn’t separate like this, so my guess is that the cacao overheated/burned. This could cause it to clump and make it impossible to blend smoothly. Was it originally smooth and then separated? These look so delicious! Yum! Hi, Megan. Yes, peanut butter also works great! Is there any substitute for the almond butter? We have lots of nut allergies in our house, so no peanuts etc. thanks in advance. Hi, Matt! Yes, sunflower seed butter works great as a substitute for the almond butter. Hope this helps! This recipe looks amazing and I am looking forward to making it. Do you have a calorie count or nutritional breakdown for it? Thanks! Hi, Christine! Thanks so much. I don’t have nutritional info for it, but there are a lot of great calculators online. Hope you enjoy! 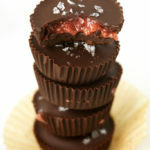 Hi, do you think this recipe would work layering it in mini muffin tins to make chocolate caramel cups? I would like to make it that way or attemp to cut into smaller squares for a party, any advice? Thanks! Hi, Jenn! I haven’t tried it myself, but I don’t see why it wouldn’t work. I’d line the muffin tin with parchment paper liners to ensure they don’t stick. Enjoy! Hi- do you think I could use ghee as a fat in the caramel instead of coconut oil? I don’t like coconut oil and don’t keep it in the house, but i have lots of ghee! Hi, Rachel! I think that would work okay but can’t say for certain since I haven’t tried it myself. 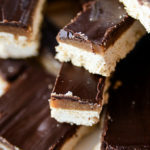 I am going to attempt to make the Vegan Caramel Slice for my 2 nieces that are vegan. This may be a silly question but what base do you use for this recipe? I may need my glasses checked. Hi, Donna! No silly questions around here. I use an 8 x 8 inch pan (see recipe)—is that what you’re referring to when you say “base”?